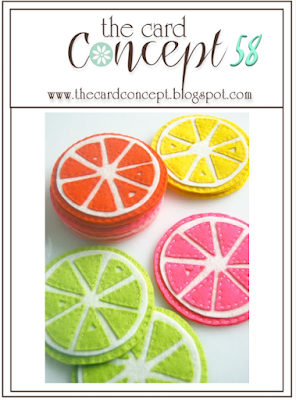 This week at The Card Concept the theme is 'Sweet and Sour'. I love the felt versions of the citrus shape and the lovely clear colours. For my DT card, I started with a stencilled background. 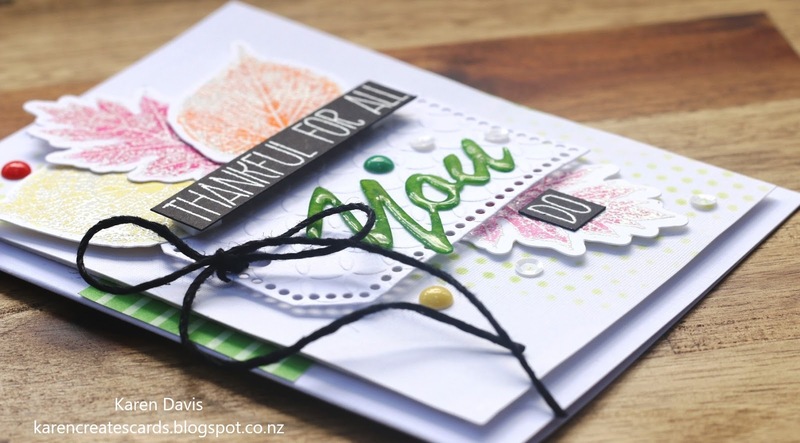 The white embossed Autumn leaves have been coloured with Distress Ink. The tag is dry embossed. The 'You' is created on the Silhouette using the Brush Stroke Font. Once it is cut I coloured it with Distress Ink and Clear Embossed it three times. This makes it rounded, raised and shiny. The black part of the sentiment is white embossed on black card. Hero Arts - More Real Leaves stamp set. Hero Arts White and Clear embossing powder. I have not done a lot of creating lately. Much of my time has been taken up with my 81 year old mum who was diagnosed with breast cancer two months ago. On Thursday last week, she had a left breast mastectomy, with one lymph node removed (waiting on results). I am happy to say she is recovering very well and will be even better when the drain comes out. My thanks go out to our wonderful friends who prayed for her. Gorgeous, Karen! Love these leaves and the stenciled tag! Great card, Karen! I love all these colorful layers! The color is bright and fresh too - -great idea! I'm so glad your mum is doing better, Karen. It must be so worrying for you. 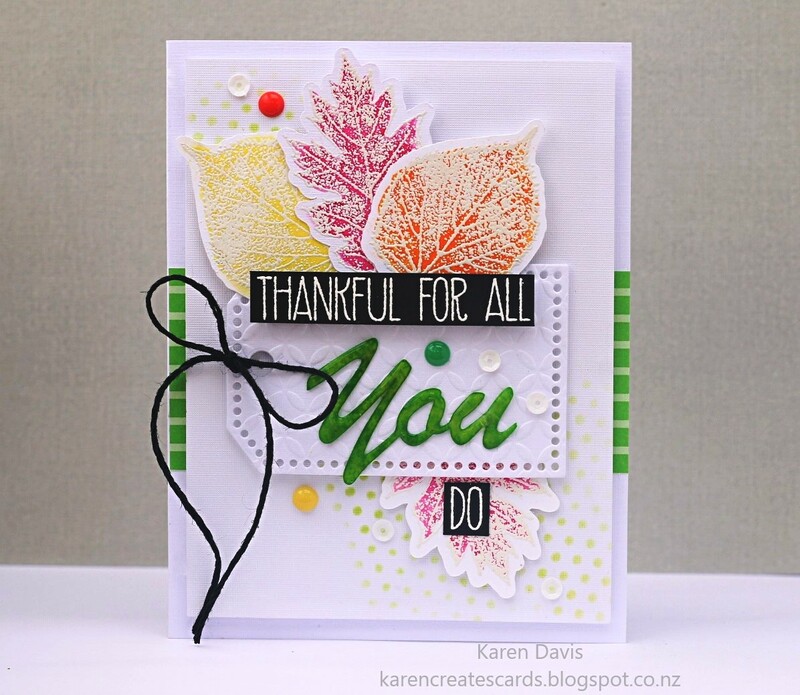 Your card is amazing and those leaves look fabulous! OMG I just read your last post after I posted my comment about your fab card regarding your mum (big hugs to you both). 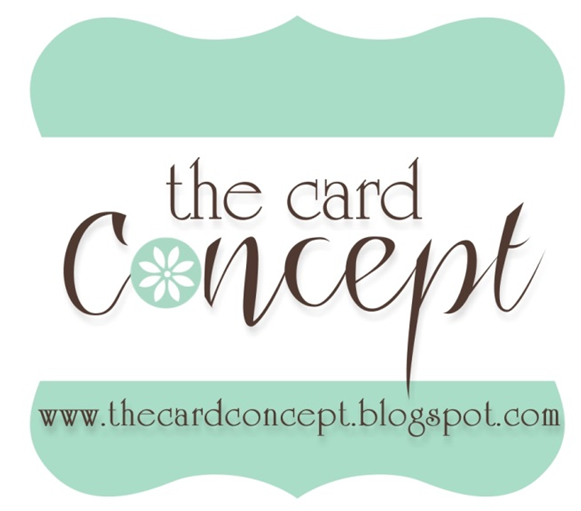 Love all the pretty layers of your gorgeous card!!! Layered perfection in fabulous colours!